Standard - $20.99 Only 7 left! Is there anything more classic yet elusive than the perfect cat eye? Who doesn't want the slinky confident look of your typical housecat? It's something about those eyes that allow felines to get away with all sorts of antics. Their eyes keep you sitting still even while they crouch to pounce at your hand. They push glasses of water off tables casually. They raid the cupboard for treats. If dogs did that, they'd be in trouble but humans know that there is no way of guilting cats into good behavior. They do what they want! So whether you're dressing up as a mischevious alley cat or perfect preening kitty, a killer cat eye is key to your look! 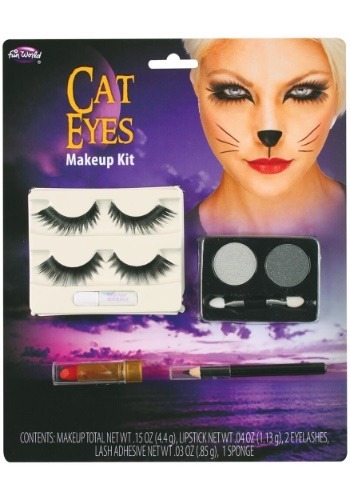 Perfect the cat look with this makeup kit. The gray eyeshadow gives his look a dramatic touch. The eyeliner can perfect the cat-shape to your eyes while the lashes are dramatic enough to be seen from across the room. Add sassy whiskers and a line of red lipstick, and you'll be ready to stir up some catlike trouble. You're far from limited to the classic black cat costume. You can expand your selection to tiger and leopard costumes as well. You could even dress up as a catsuit-wearing jewel thief. As we all know, true sneakiness is all in the eyes.